Over the years, I’ve traded a lot of stocks. Even though, I took some pretty bad losses, I always seem to offset them with my gainers. There is one unit trust that I have kept for the longest time. BPF.UN has given me a steady monthly distribution and share price appreciation. Early 2009 was a pretty bad year for stocks. At that time, I was pretty cash strapped. I didn’t have a whole lot of money laying around to invest in. But I wanted to put some money into a stock that will pay itself off. On May 2009, I decided to put down 200 @ $9.10 on BPF.UN. At that time, they were paying out 11.5 cents per share monthly! So for a while, I was receiving $23/month… the distribution was lowered due to some rule changes to unit trusts in Canada. Not bad for a relatively small market sized eatery on the West Coast of Canada. I have more than doubled my money here. If I only invested more, I would have been much better off now. PS. Scotia Itrade is charging me a quarterly inactivity fee of $25. The only two stocks I hold there are BPF.UN and 300 shares of CHE.UN. The combined total is less than the $10,000 minimum requirement . So I might have to sell my beloved BPF.UN and move the money to Virtual Brokers. Itrade commission fee per trade is $24.99, really high if I wanted to stay put with them!! BPF.UN 235.20 This is my superstar! IPL.UN 450.48 Very strong contender! CHE.UN 2,172.00 Invested lots, hope it appreciates. KEG.UN 96.00 Classy dining unit trust. BMO 1,152.00 Lagging behind other Canadian Banks. CLF 250.00 This is my loser stock! REI.UN 552.00 Newly aquired, it better go up! WYN 92.00 Aquired for price appreciation mostly. Total $4,999.68 If I kept all my stocks for the year! There wasn’t any trades in June except for one BUY transaction: CHE.UN – 300 shares @ $14.60 in my Scotia Itrade Margin account. Scotia Itrade recently updated its website look. With this change, their commission based price jumped from $19.99 to $24.99 per trade for assets under $50,000. I am not too happy, but I’ll still keep my account active with the stocks that I’m currently holding. Maybe this is a good sign to encourage me not to trade as often. All of my unit trusts are making me money except for CHE.UN! Yet, I have the biggest stake in this particular unit trust. Yes, I made the mistake of buy it at the wrong time. Now, I deal with the consequences of being impatient and wanting to get into the stock when my capital was available. The one problem I have is never wanting any freed up money to be sitting in cash. That’s my pet peeve. So I always try to buy a stock or unit trust right away which can be disastrous. Never buy at the top, I’ve been hit hard by Apple… but if you believe in the company, please HOLD instead of selling out like I did on Apple. Usually, I am a true stickler, but I just snapped during that week when everything was crashing down day after day. Frustration and fear took over me leading to my own demise now. Stuck with losses up to my neck. Climbing out of the red will be hard, but if I just forget about it and let my distributions flow… I’ll be ahead by not selling anything at a loss. 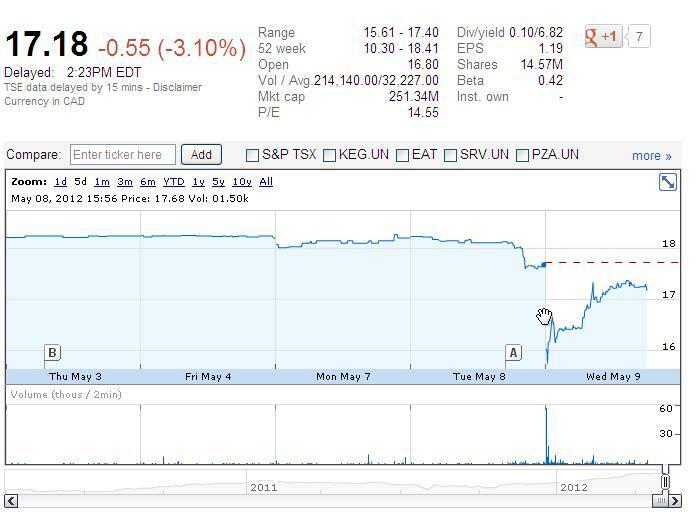 OMG, Boston Pizza really did pull back today after this Globe and Mail article was published on May 8th! Oh no, I’m going to sell, it’s going to drop like crazy!! Do you hear the sarcasm as I type this out? Yes, Boston Pizza is going to announce their earnings report after trading hours of today. This may cause uncertainty for some investors. They want to protect their capital or gains and pull their money out of Boston Pizza. Boston Pizza has consistently paid out a distribution month after month. It’s been relatively untouched by the events of the Greek Crisis. Boston Pizza Fund was holding strong throughout the day above the $18.00 mark. After this article was published at 2:03PM, Boston Pizza took a 50 cent drop! As you can see in the chart below, this morning investors were panicking… selling as low as $15.61! When I checked my stocks in the morning, EVERYTHING was red. What really stood out was the big loss in Boston Pizza in the morning trading session. As the day is progressing, the price of Boston Pizza is slowly creeping up again… at the time of writing this 2:56PM. Updated Earnings Report: Boston Pizza Royalties Income Fund (TSX:BPF.UN). First-quarter ended March 31, 2012, net loss $6.9 million, net loss 47.8 cents per share; 2011, net income $2.95 million, 20.1 cents per share. Revenue: 2012, $7.52 million; 2011, $6.98 million. I am dissapointed to see the net loss by Boston Pizza. However, I’ll continue to monitor the price and momentum of the Boston Pizza before making any decisions. NOTE: I currently have 200 shares since June 2009.